Throwing out an idea to increase KDF play. I was thinking if we made Wednesdays KDF day/night, we could give our Klingons a little more play time and action. Voluntary of course. I will commit Wednesdays to my Klingon, Auloh. Let me know if you would be interested in joining on Wednesdays. Sounds like a plan. A good plan. Count me in! Well my favorite Captain is a KDF Aligned Jem’Hadar – Garm’iclan. Cannot promise to be on and available on Wednesdays, but if I am hit me up. This reply was modified 3 days, 20 hours ago by Chaos_EN2. Looks like we are off to a good start. I’m looking forward to Wednesday. Yeah, this whole idea got me a little excited. So much so I made a new Klingon Captain just because of it. This reply was modified 2 days, 21 hours ago by Chaos_EN2. This reply was modified 2 days, 20 hours ago by Chaos_EN2. Just a reminder…..we start KDF (Wednesday) tomorrow! Chaos, like that klingon you created. That’s a mean eye-patch. Like it. @sargon and @anukis, thank you both, believe me or not I got the idea of her look off a Lady I used to hang-out with while in the Navy. Nothing serious BTW just friends, and she used to wear Eye-patches that matched her outfit. Anyway I got her up to level 11 this morning, and I am using a Somraw Raptor now, and I am going to “role-play” how I equip her ships, I.E. using the listed standard configuration for weapons, but changing them out for Uncommon, Rare, etc., Weapons. Now I am going to try to write up her background, and try to figure out if I can copy and paste it somehow in her game window? And I also need to get her into the Fleet if there is room? BTW: Anukis is your Commander’s away team sisters or clones, or you just like the look? Just wondering if there was a story there? This reply was modified 1 day, 21 hours ago by Chaos_EN2. It’s great to see you have a concept for your KDF character, from the eye-patch to backstory. To answer your question about my KDF Alien and her BOffs… it was just an aesthetic, rather than a backstory… but even that makes her fun to play. I’m still equipping the team for ground as space is my priority but they’ll be as canon as I can make them. They also have saved TOS outfits which fits with my preferences. 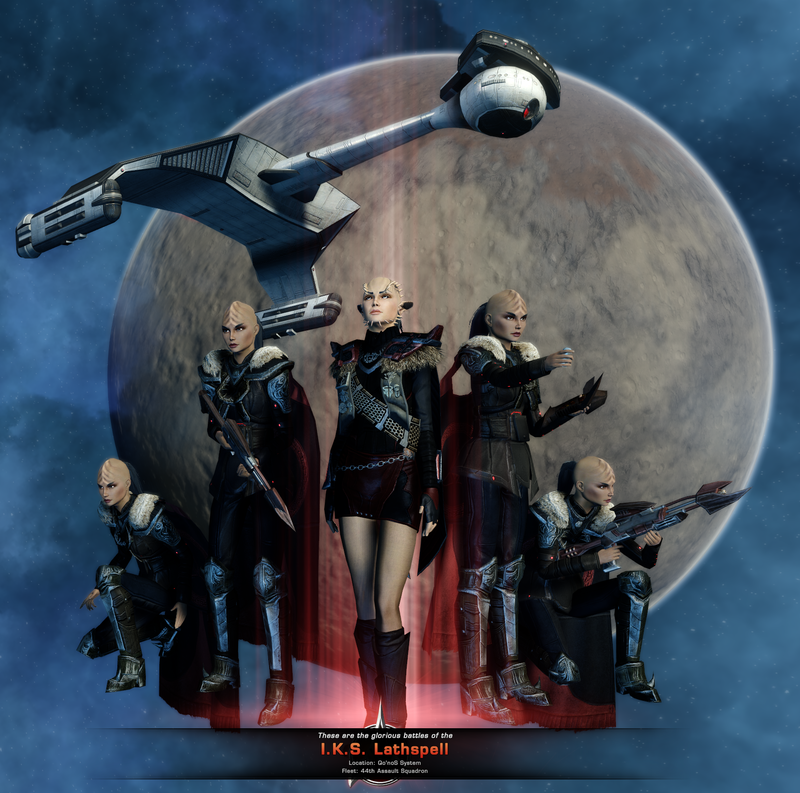 My FED main has had the most time and effort invested, in BOffs, space/ground gear, outfits and backstory etc but I also have a pair of Romulan sisters… one FED and one KDF. Fractured family, you might say. Their simple backstory is a presence in my mind whenever I play them and I feel as though it adds to their fun and enjoyment. I have a lot of other characters that are soulless and functional alts, so the difference is marked. If you haven’t already… just ask in chat for an invite into the KDF fleet and I’m sure it’ll be sorted pronto. Rare late night at work but I made it in time for KDF night. Just seeing if anyone posted about tonight. Well, back to the game. @sargon, during the work week I mainly play during the early morning hours, so that is why I was not on in the afternoon. But I am hoping to be off as scheduled for Friday, Saturday, and Sunday so maybe I can hook up with some of the Rest of the 44th Assault Fleet. And I got her in the Fleet and up to Level 15, Qapla! I’m glad someone is around to help push the KDF thing in the mornings. It’s all good. I will keep encouraging KDF on Wednesdays. Well I will try to do the KDF proud, Sargon, BTW one of the missions that I have completed was the Mission: Temporal Ambassador, so I got a boxed Kamarag Battlecruiser sitting in my backpack. So what is it like? Anyone? And the Hargh’peng Torpedo Launcher is it worth upgrading? The reason I am thinking upgrading it was, from a role-playing idea I got in the back of my head, but at the same time I do not want to tie both hands behind my back, and pass up better torpedos.